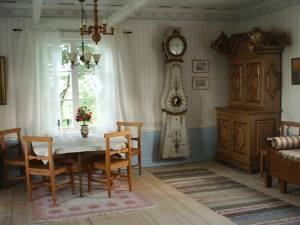 Experience the midnight sun close to the polar circle in a newly renovated traditional Norrbotten farm with all the old features lovingly preserved. Welcome to Förryttargården. 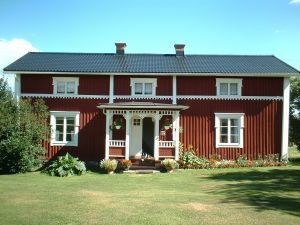 Stay in your own farmhouse (about 100 square meters) in typical Norrbotten-style and an atmosphere of the old days around you. Newly-repaired, but with all the traditional interiors still preserved. 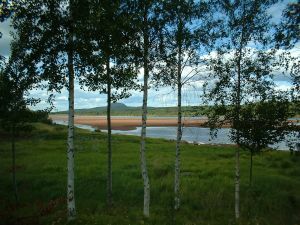 Farm is beautifully situated by the E10 motorway between Luleå and Kiruna, 4 km from downtown Överkalix. Dairy farm. The house has four beds. Road E 10. First exit to the right after the HEDENSBY signpost. As the farm is situated beautifully about 100m from the untouched river Angesan it's possible to go swimming. For those who want to get a view over the beautiful surroundings a trip to the top of Brannaberget is recommended. Linafallet and Jockfall are examples of two impressive waterfalls. 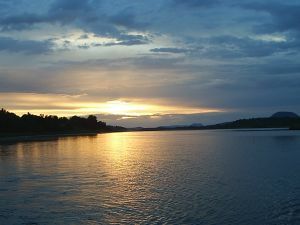 The river below Jockfall is seen as one of the best places in Sweden for salmon fishing. A visit at Martingarden, a well preserved farm from the beginning of the 17th century gives a good insight into local history. At cultural centre Sirillius a Russian orthodox church and a gallery with beautiful icons can be seen. The tractor museum with over 100 tractors and machines gives a good view of the technical development. The Polar Circle (Arctic Circle) is situated 25km north and of course it's almost a mandatory visit. On the journey further north in Sweden the Ice hotel in Jukkasjarvi shouldn't be missed.